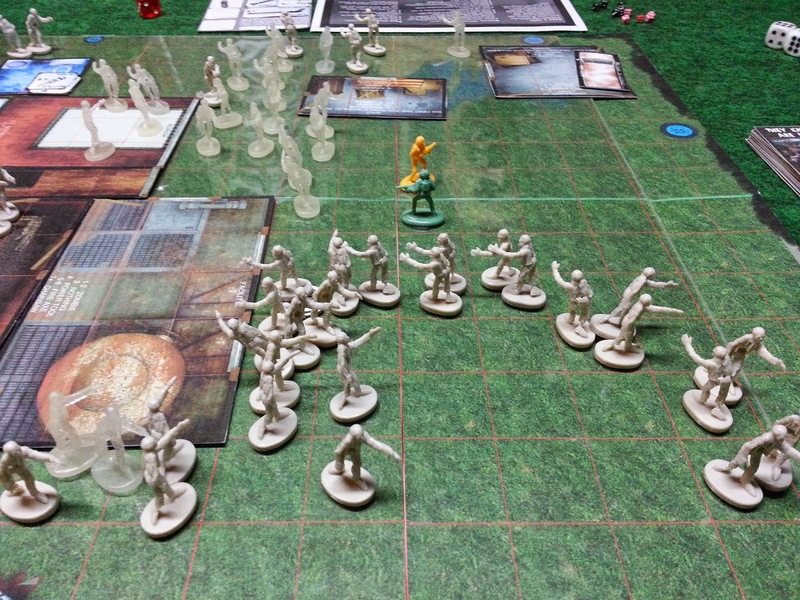 With Kenny out for the night, it was time to get out the zombies for some ol' fashioned fun! 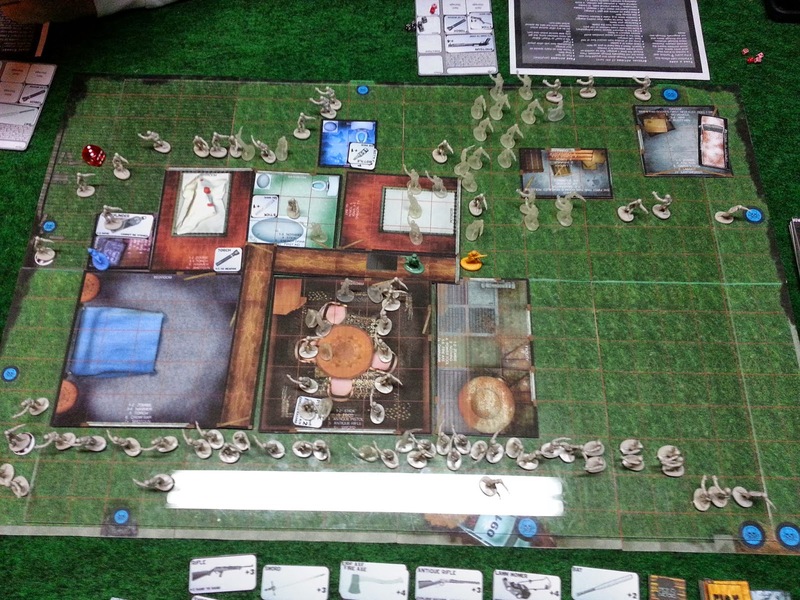 My go-to zombie game is Dead of Night (DoN), a web-published, print and play gem. 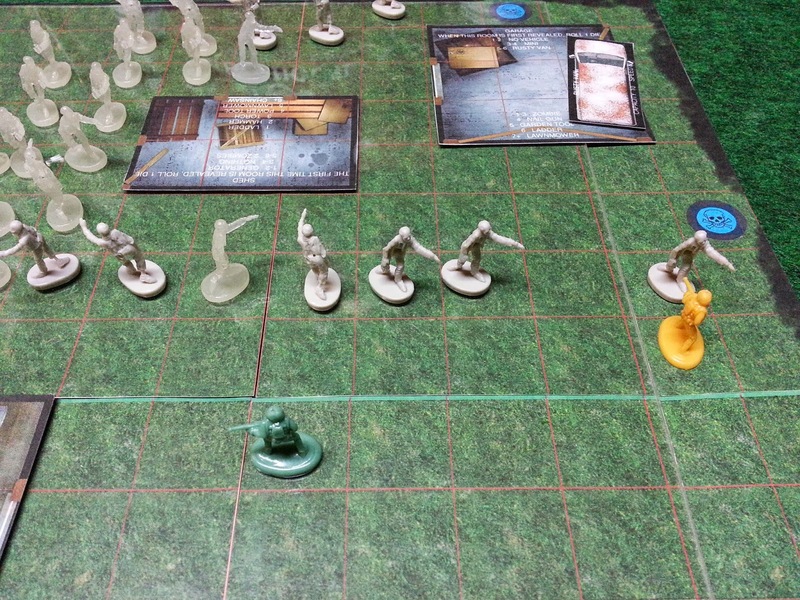 I also have Zombie Plague (ZP), but I wanted to play DoN due to it being "meatier" than ZP. 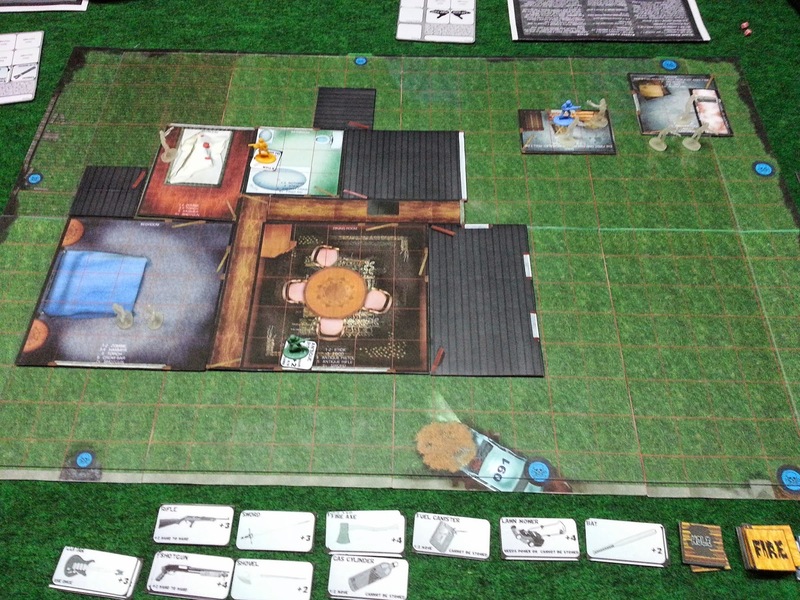 I've played the first scenario, The House of Lots of Corpses, a couple of times over the years and have had a blast each time. The game truly plays like your watching the climactic end of a good zed movie or TV show. In many ways it reminds me of the Reactor Room scenario in the incredible Aliens game. I also like that everyone plays as humans. The zeds are auto-ran. Yay!!! So...get in, get your stuff and fight your way out. Easy, right? The gaming gang was Jon Mark, Carl and me. Neither of them had tried the game before, so after a couple shots of whiskey and jalapeno poppers, we commenced the fun. 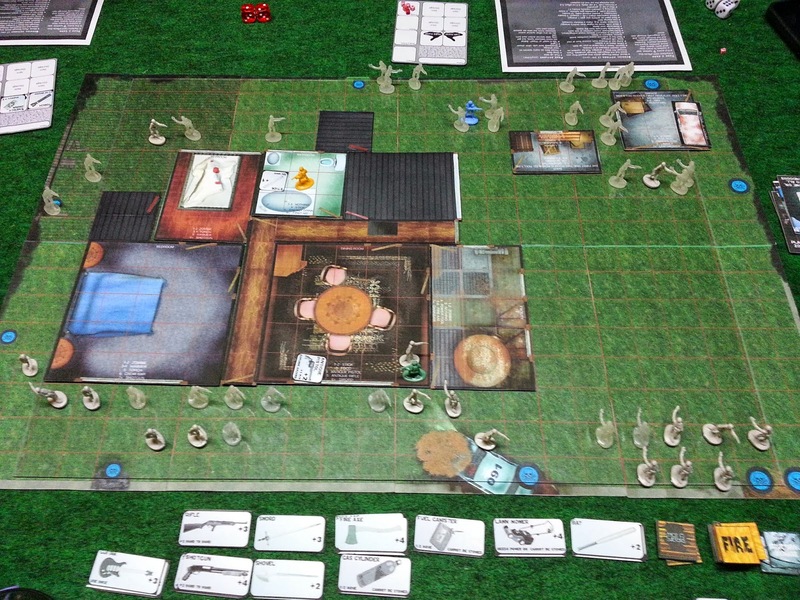 My first turn I opened up a couple of rooms, fought a couple zombies in one of said rooms and then found an antique pistol and an antique rifle. I had to drop the pistol, as it took both hands to carry the rifle. I did pilfer its ammo, though. Jon Mark opened up rooms and found a torch (flashlight) and an energy drink. Carl wasn't so lucky. He first went into the garage, where he found an old rusty van that would be a perfect getaway vehicle...if it had gas and keys. Unfortunately, he also found a few loitering dead heads who tried to steal his brains. While they missed Carl's cranium, they did bite his body. 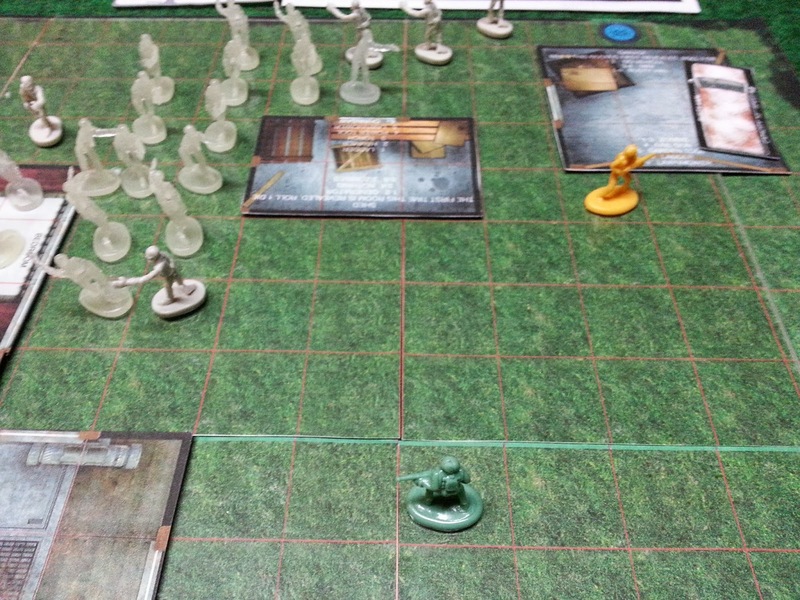 Thus infected and rather mad at his luckless start to the game, he ran into the shed...only to uncover two more zombies! A brief scuffle resulted in him taking yet another wound before heading for the house. 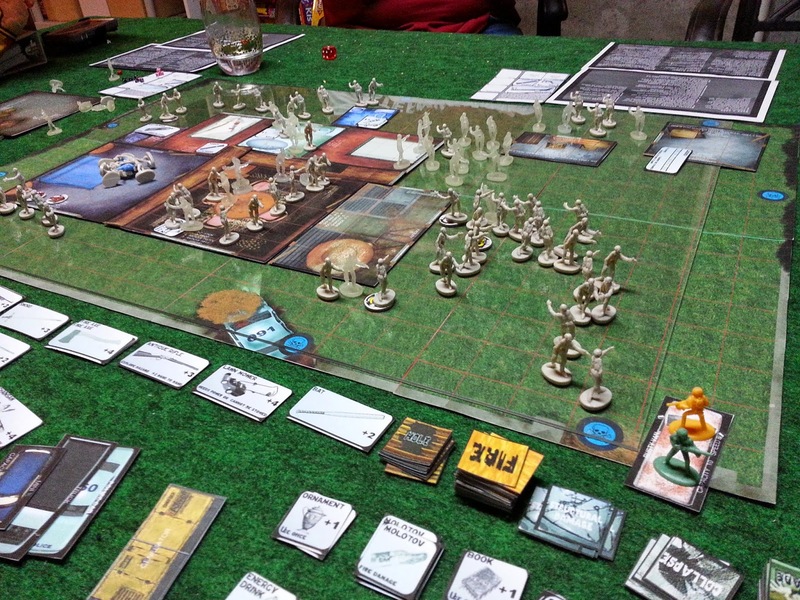 The search of the house continued as the zombie horde slowly progressed toward us like ants to a brain picnic. At first we didn't have a coherent plan. We found a lot of sticks and flashlights, but other than my rifle, not many weapons. Eventually, Carl's declining health meant he was slowing down. Jon Mark had to leave him in the back bedroom. On the plus side, Carl then recovered a shotgun, which played a small role in the game's end. 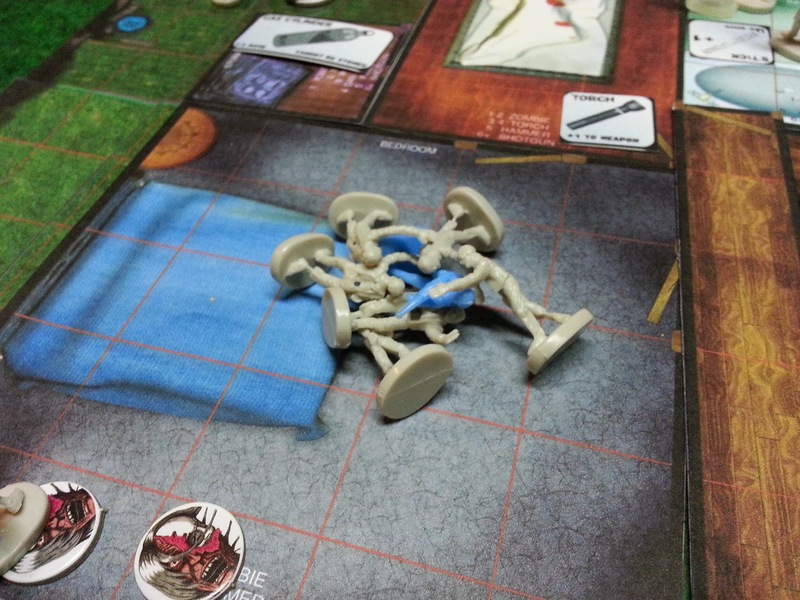 I started clearing out some zombies with the rifle, but then the dang thing blew up in my hands, injuring me. With my hands free, I grabbed the fuel canister and headed toward the garage. Jon Mark ranged ahead of me with his trusty bat, intent on giving his best impersonation of the mighty Casey. He managed to blast through six the rotters, clearing a path to the van for me. Around this time, Carl was feeling poorly due to his bite and wanted payback. 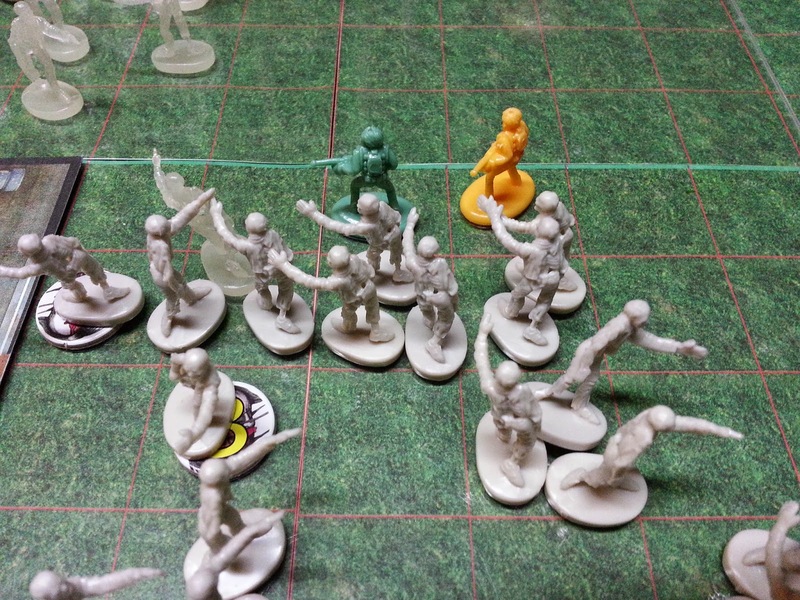 He pumped his shotgun and nailed six of the undead suckers! He then flipped his grip to the gun's barrel and charged the nearest target, cleaving its head like an overripe melon. The rest is typical for this genre: He was overrun and ripped apart. RIP, Carl's blue guy! Meanwhile, the zeds south of Jon Mark and I surged ahead and made contact with me. I could only move half speed due to the weight of the canister and was defenseless. Jon Mark once again showed how stout Louisville Slugger bats truly are and bailed me out of the mess without a hitch. I fueled the van, then jumped in. Jon Mark ran to the front and hot wired the vehicle. He had a 33% chance of either being successful, accomplishing nothing, or ruining the van forever. I guess Carl took all the bad luck, as Jon Mark was successful on his first attempt! We quickly put the sucker in reverse and got the heck out of Dodge! 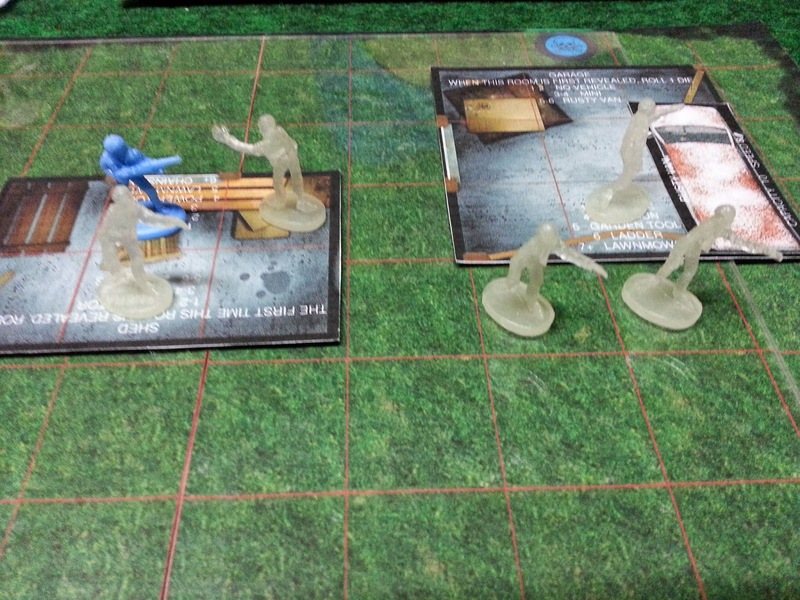 Jon Mark "won" the scenario, as he had the most zombie kills, but we both lived to play scenario two...next week! A very fun night with a couple of great guys! I can't wait for the next game! looks really cool I'm glad I was not there my brains would be gone.